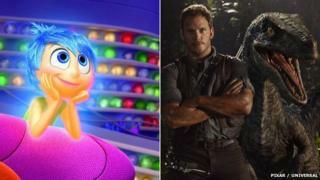 US cinema-goers flocked to the big screen this weekend, as Jurassic World and Pixar's Inside Out battled for box office supremacy. Jurassic World roared into the lead with $102m (£64m), making it only the second film after The Avengers to make $100m (£63m) in two separate weekends. Pixar's animation, which unfolds largely inside the mind of a young girl, came second with $91m (£57m). The record was previously held by Avatar, which took $77m (£48m) when it debuted in 2009. However, Inside Out's second place opening breaks Pixar's perfect run at the top of the charts. Starting with 1995's Toy Story, all 14 of the studio's previous films had opened at number one. "Inside Out would have been number one in any other weekend," said Phil Contrino, vice president of BoxOffice.com. "At the end of the day, it doesn't matter. Being number one is overrated." Disney - which owns the Pixar studio - noted that Frozen had also debuted at number two, before going on to become Disney's biggest-ever animated release with a global haul of nearly $1.3bn (£817m). Inside Out was judged to be a tough sell. A genre-defying story of a girl's inner turmoil, it portrays her emotions as characters - Joy, Sadness, Fear, Anger and Disgust - who live inside her mind. But reviews have been overwhelmingly positive, with critics praising the film's thought-provoking, emotionally-powerful script. "This is another example of word of mouth spreading fast for a movie and people getting behind in a big way," said Contrino. Meanwhile, Jurassic World broke another record - it is now the highest-earning film in the dinosaur franchise. It has made $398m (£250m) in just two weeks, surpassing the $357m (£224m) made by the original Jurassic Park in 1993. The US full box office top 10 is as follows.